Climate Interactive, working with our partners at Mohammed VI Polytechnic University (UM6P) in Morocco, has completed the first major version of our Climate and Agriculture Policy Simulator. Building on the demonstration version discussed last fall, this system dynamics decision support tool helps policymakers see what could work in agriculture. Increasing the agricultural production in Africa is vital to the well-being of a growing population. Reducing greenhouse gas emissions from agriculture and land-use change is vital to meeting our climate goals. Climate change is likely to expose Africa’s already vulnerable population to additional food security risk. Policymakers need to see and understand the trade-offs between different solutions as they respond to these challenges. Our Climate and Agriculture Policy Simulator is a national-level model designed to explore how combinations of agricultural policies and practices could contribute to solving food security and climate problems. The Climate and Agriculture Policy Simulator evaluates policy impacts on the interlinked agricultural system in real-time. Importantly, the simulator’s user (e.g. 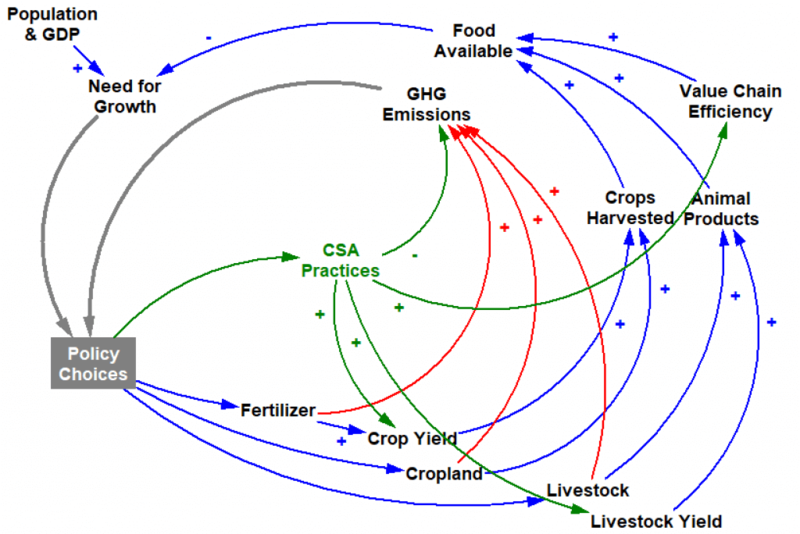 a policymaker, analyst, or NGO) is central to the feedback loop, making the choices as to how to meet their agricultural and climate goals (see the grey “Policy Choices” box in figure above). Feedback endogenous to the model enforces physical constraints and delays. The Causal Loop Diagram above shows the underlying logic of the simulator. As population and living standards grow, choices must be made to ensure available food grows as needed to meet demand. 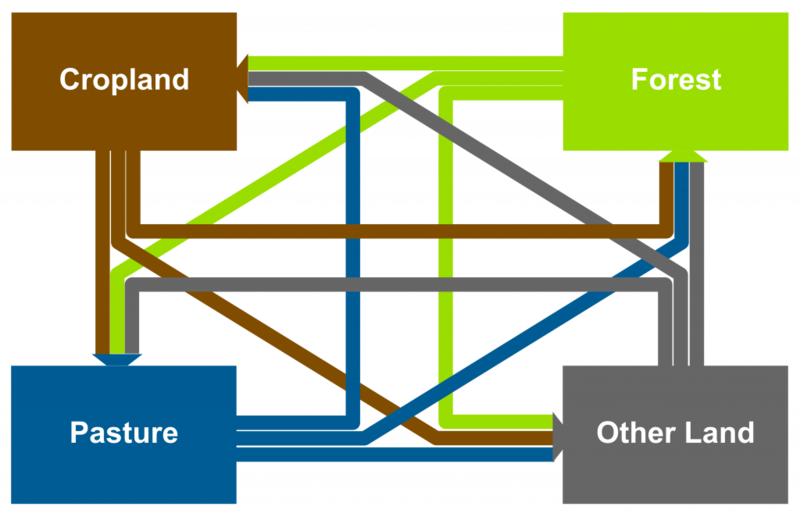 A business-as-usual path, in blue, would simply increase the land used for crops, the livestock population, and the amount of fertilizer. Each of these, unfortunately, contributes to greenhouse gas emissions. The premise of Climate Smart Agriculture is that there are some practices that can lower emissions, raise yields, and improve efficiency so that the country can meet both its food needs and its climate goals. One improvement in the model compared to last year is the explicit inclusion of land and land use categories. The total amount of land is physically conserved. The land used for agriculture can only increase so far before it begins to crowd out forest, grassland and other categories; if there are goals for reducing deforestation, there has to be a reduction in demand growth for agricultural land. Agricultural production is therefore based on realistic limits on land. We base demand growth on population and gross domestic product projections by the UN, World Bank and others – and allow the users to select different scenarios. Food harvested depends on land, livestock and yield. Food available also includes the effect of imports, exports, and losses along the value chain. Greenhouse gas emissions are calculated from the amount of cropland and livestock and the emission factors specific to the agriculture sector. All of these depend on practices: either business-as-usual trends or choices the user makes. The trends are calibrated using data from trusted sources. This version of the simulator is calibrated to Ethiopian agriculture, because the published documents are useful for this purpose. Historical data are obtained from the FAO (FAOSTAT 2017) and Ethiopia’s National Communication to the UNFCCC (Ethiopia 2015b). The policies the user can adopt are based on proposals found in Ethiopia’s strategic documents (Ethiopia 2011, 2015a, 2016). Next week we will discuss the insights we gained from experimenting with the simulator. If you have any questions regarding this work or helping with further refinements to the simulator, contact Travis Franck. Click here to read about our latest insights from the simulator. Ethiopia 2011. Ethiopia’s Climate-Resilient Green Economy Strategy (Brochure). Ethiopia 2015a. Ethiopia’s Climate Resilient Green Economy Climate Resilience Strategy: Agriculture and Forestry. Ethiopia 2015b. Ethiopia’s Second National Communication to the United Nations Second National Communication to the United Nations Framework Convention on Climate Change (UNFCCC). Ethiopia 2016. Intended Nationally Determined Contribution (INDC) of the Federal Democratic Republic of Ethiopia. FAOSTAT 2017. Food and Agriculture Data (online database) http://www.fao.org/faostat/en/#data. Accessed Jan 2017.